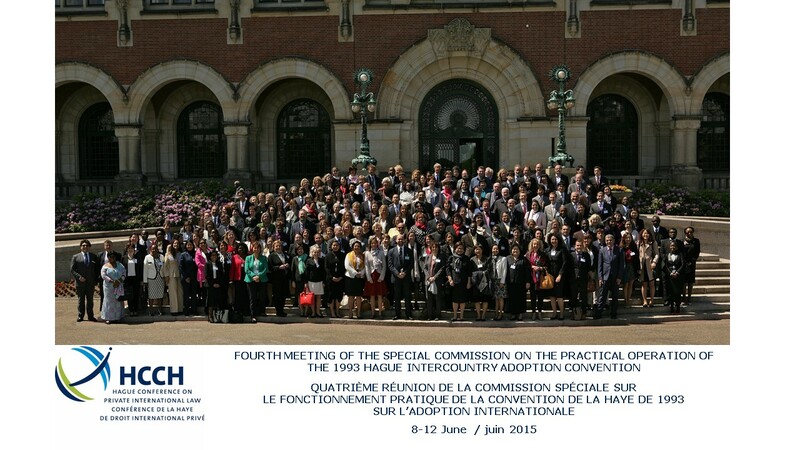 From 8 to 12 June 2015, a Special Commission meeting was held in The Hague to review the practical operation of the Hague Convention of 29 May 1993 on Protection of Children and Co-operation in respect of Intercountry Adoption (the "1993 Hague Convention"). More than 255 experts, representing 74 countries and 18 international organisations, participated in the meeting. On the first day, a discussion on the "20 years of the 1993 Hague Convention" was held. On subsequent days, a range of issues were discussed, including: the intercountry adoption of special needs children, post-adoption support, habitual residence and the scope of the 1993 Convention, co-operation, issues of procedure, the use of modern technologies in intercountry adoption, the financial aspects of intercountry adoption and how best to prevent and address illicit practices. The meeting provided a unique forum for the authorities of the various Contracting States, as well as States actively considering joining the Convention, to share concerns and experiences in relation to the interpretation and application of the Convention. In terms of further work, the Special Commission recommended that, amongst other matters, work should continue to develop further the guidance on habitual residence and the scope of the 1993 Hague Convention (see Prel. Doc No 4). It also recommended that work continue to provide guidance on the recommended content of the Article 15 and 16 reports, the post-adoption report and the statement of consent of the child to the intercountry adoption, as well as other new model forms (see Prel. Doc No 5). The meeting also recommended that the "Experts' Group on the financial aspects of intercountry adoption" and the "Working Group on Preventing and Addressing Illicit Practices" should continue their work. In relation to States considering becoming party to the Convention, the Special Commission agreed that the Permanent Bureau should develop a tool to provide practical guidance to assist such States with their legal framework for adoption. The great value of the Intercountry Adoption Technical Assistance Programme ("ICATAP") of the Hague Conference was also recognised, as was the important support it has provided to States in the implementation and operation of the Convention. In addition, a "Declaration on the need to develop a harmonised framework for the adoption of children in Africa" was submitted by the Delegations of Africa present at the Special Commission meeting and was applauded by all participants. Finally, the Special Commission warmly welcomed two new States Parties to the 1993 Hague Convention (Zambia and Cote d'Ivoire). The Convention now has 95 Contracting States. All the documentation for the meeting, including the agenda, can be found here. The Conclusions and Recommendations of the meeting are available in English, French and Spanish.